Want your data center deployments to be threat free? Look no further than FortiGate Firewall on rent as it offers highest threat protection performance. The leader in enterprise network firewalls, FortiGate attains unmatched real-time visibility of the applications which your users are running. Get advanced persistent threat protection, intrusion prevention system, application control, integrated WLAN controller, web filtering, data loss prevention, antispam, antimalware, antivirus and many more application protections under one roof.Protect your critical applications with ultra-low latency and highly scalable segmentation. Next generation FortiGate firewall utilizes threat intelligence security services and purpose-built security processors from FortiGuard Labs. It delivers SSL inspection performance and higher protection that protects your applications from hiding in malware encrypted traffic. Complexity reduced while using FortiGate firewalls on rent as it provides automated visibility into network, applications, and users. FortiGate provides security ratings so that businesses can adopt security best practices. 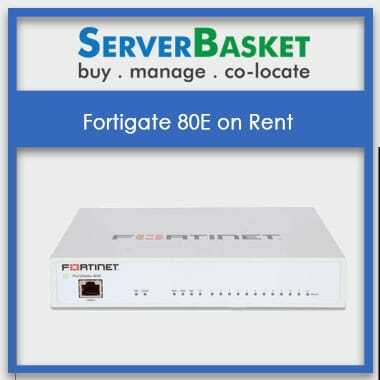 FortiGate firewall on rent is available in different models and specifications depending upon the business scope. Server Basket offers different hardware appliances (from entry-level to high-end devices) to meet the needs from lower to demanding threat protection requirement. There are up to 11 FortiGate modules that recommend from 10 to up to 1000 users. Get threat protection throughput performance ranging from 200 Mbps to 3 GB/s. 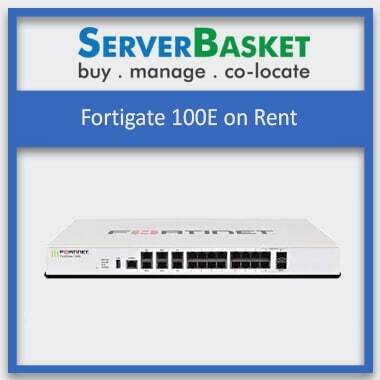 At Server Basket, we offer licensed FortiGate Firewall on rent that meets the compliance standards like HIPAA and PCI. FortiGate various modules have gone through several tests in NSS Labs DCSG to measure Intrusion Prevention and security effectiveness performance and have achieved the “Recommended” Status. The NSS labs claim that FortiGate IPS produces the highest cumulative blocking rate as compared to other competitors. Protect your organization from unwanted threats and secure your network without investing in brand new hardware. We lease out the secured FortiGate firewalls at an affordable price. Now get the best enterprise Firewall module at a much lower cost only at Server Basket. Server Basket offers free instant FortiGate configuration support. 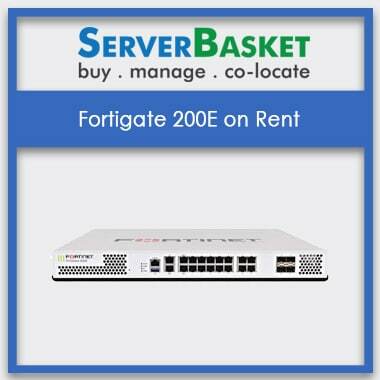 We provide 24/7 comprehensive technical support for all FortiGate Firewalls on rent. Our services include Firmware and extensive upgrades, advanced hardware replacement, Traffic Management, VPN and Threat protection Bundle. Sever Basket does everything to ensure that the product is always delivered on time and in good condition. We stick to strict deadlines and make sure that the customer receives the product within 2-3 business days.